Thank you to all our friends and well-wishers! While we do not yet have an Official Re-Opening date, renovations are moving ahead. We hope to start taking reservations for Calibishie Cove in June 2019. Stay tuned for updates! Or visit us on Facebook at Calibishie Cove Dominica. A Dominica hotel where you can get away from it all. Traveling to Dominica for adventure, relaxation, nature, or all of the above? Calibishie Cove is an acclaimed Eco-boutique hotel found on the peninsula on the mountainous island’s beach-studded northeastern corner. Nestled 80-feet above the pristine Hodges Bay Beach, Calibishie is a private relaxed beach hideaway. The retreat commands cliff top spectacular ocean, beach and wilderness views. Among Dominica hotels, what is special about Calibishie Cove? We offer a feeling of true immersion in nature while being conveniently close to the village of Calibishie and only a short drive from Dominica’s airport, Douglas Charles. Gentle sea breezes and ocean views envelop you during your stay. A riot of colorful hummingbirds dance in the garden while you enjoy complimentary breakfast on your balcony. Cooking for our in-house guests only, we offer some of the best food in Dominica. Experience a true enjoyment of Dominica culture as our all-Dominica staff takes care of you. 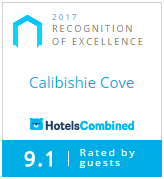 Calibishie Cove is a 2017 World Luxury Hotel Awards Winner!